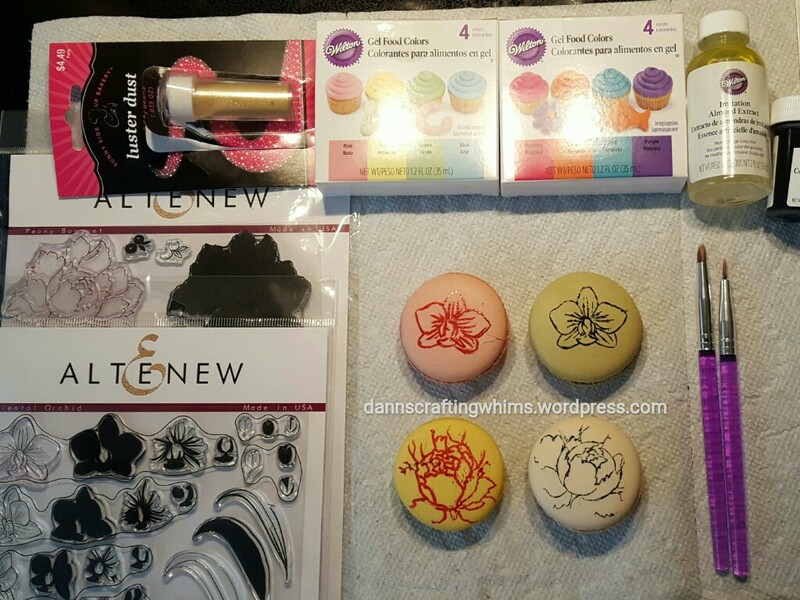 Spring Coffee Lovers Bloghop: Altenew Card & EDIBLE stamping on macaroons! I’m excited to be back again as I think you’re going to enjoy this post! Once again, the Spring Coffee Lovers Bloghop is on. By now my head was too into the project to remember to take pictures along the way, sorry! One tip: I found it MUCH better to spread the gels thin onto aluminum foil and let them sit a while until sticky before pressing the stamp into them and then onto the macaroons. I think the thin and open designs worked better than the smaller, thicker lines and more closed designs on my previous project. 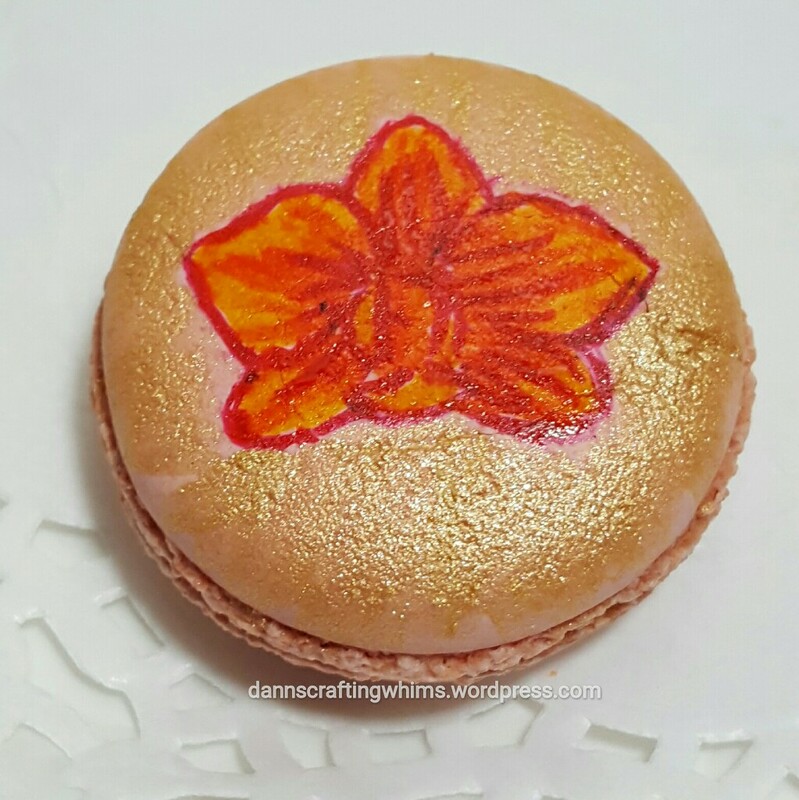 This time I mixed the gold luster dust with some drops of almond extract and painted around the smaller orchids and highlighted the petals of the peonies for some fab shine! This fun DoCrafts, Xcut embossing folder makes a great window opening for the Altenew Dancing in the Rain window. Once embossed (it cuts and embossed in ONE pass! Woo-hoo! ), I ran some Spectrum Noir Illustrator pens over the raised parts to add color. Layering one of the cutout butterflies on the window frame and having the 3d frame layered over the window stamp gives it so much extra dimension, don’t’cha think?! The butterflies and one of the hearts are drenched in the FABULOUS new Nuvo Glitter Accents in Fresh Snowfall by Tonic… it dries almost instantly for some great shine and dimension! I mixed up the sentiments from Altenew’s Dancing in the Rain and Goals stamp sets for this fun sentiment for a rainy day. To make the view even drearier, I ran over the scene with a Spectrum Noir Metallic silver pencil. Yep, as you sip your coffee and snack on some delightfully decorated macaroons on the rainy April Shower days that will soon be upon us, you can close the card and think of the May flowers that will be following close behind! I’m so happy you could stop back by today! I always look forward to hearing your thoughts on my projects. I’ll have several posts up over the next few days, including some more non-card posts (not edible, tho, sorry! ), so do plan on stopping back by. If you don’t want to miss any posts, feel free to subscribe! Thanks!! p.s. any ads on this page are placed by WordPress and are not endorsed by me. This entry was posted in Any Occasion Cards, Cards, cookie decorating, Food, Friendship Cards, Get Well Cards, Papercraft, Sympathy/Support cards, Thank You Cards, Thinking of You Cards and tagged Altenew Dancing in the Rain, Altenew Goals, Altenew Oriental Orchid, Altenew Peony Bouquet, Altenewllc, cardmaking, cookie decorating, decorating cookies, DoCrafts Xcut Cottage Window, Edible stamping, handmade cards, macaroon decorating, Papercraft, Spectrum Noir, Spectrum Noir Illustrator, Spectrum Noir Metallic pencils, Spring2017CLH, Stamping on cookies, Stamping on Macaroons, Sunny Side Up Bakery luster dust, Thermoweb Sticky Tape, Tonic Studios Nuvo Glitter Accents, Wilton, Wilton decorating, Wilton gel food colors by dannscraftingwhims. Bookmark the permalink. This is FABULOUS!! I’m a coffee lover, too. Thanks for sharing your talents. 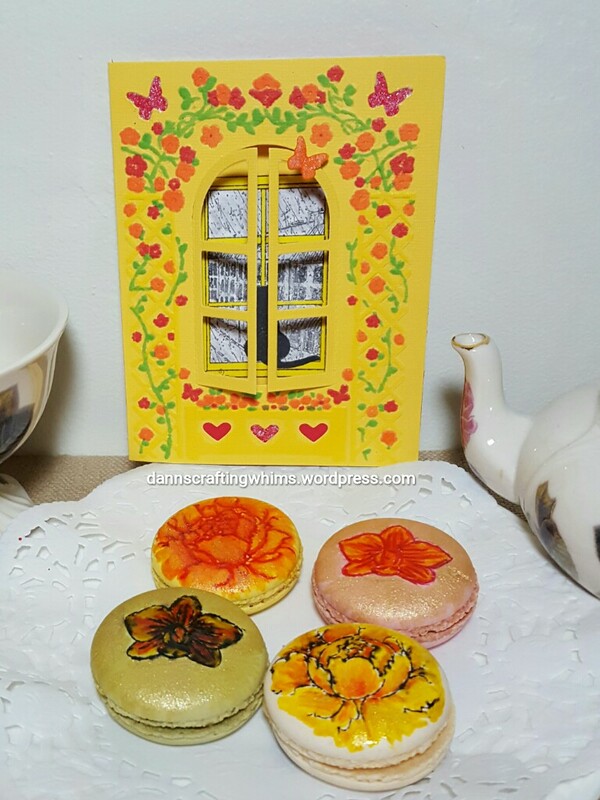 Wow–awesome macaroons and cute window card. Love the cat. How fun to open the shutters and see the cat! Love all your springtime touches! I sure enjoyed reading about your macaroon and card escapades. Love the end effects too. wow! these are gorgeous too!! thank you again for playing along with us at simon says wednesday challenge! Yummulicious and love your fun cute card! I love your creativity, D.Ann. Your card is beautiful; love the window! Hi, Ann! Oh, yes, I love that stamp! I won it from previous Super Sponsor Bossy Joscie http://joscie.bigcartel.com/ is her site and here’s the stamp: http://joscie.bigcartel.com/product/coffee-mug-address. Enjoy! Wow D.Ann, this is absolutely exquisite! 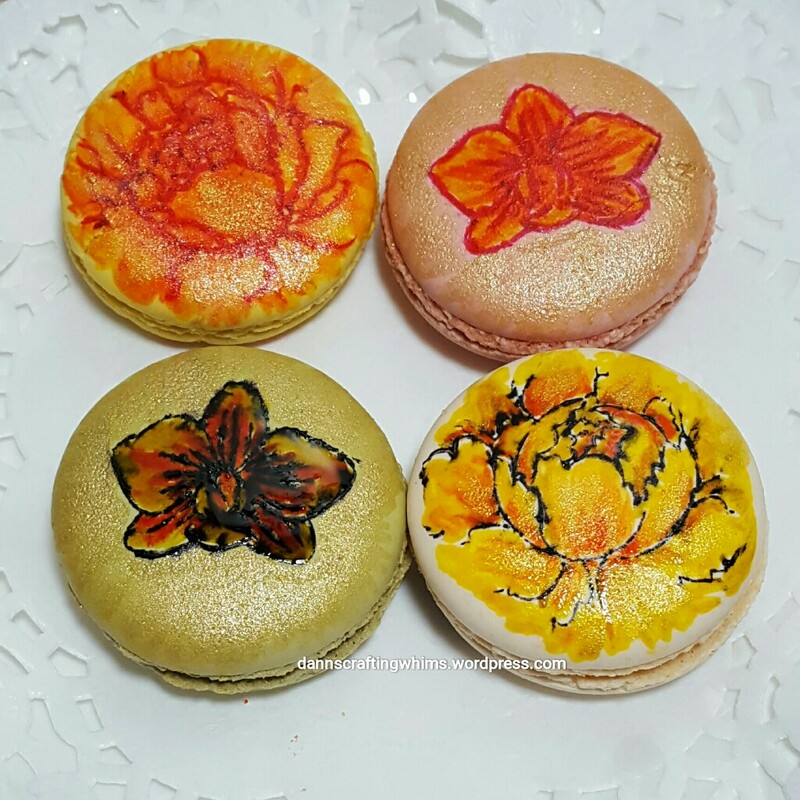 The stamped macarons are way too pretty to eat, and I would have been trying to figure out a way to make them last forever. 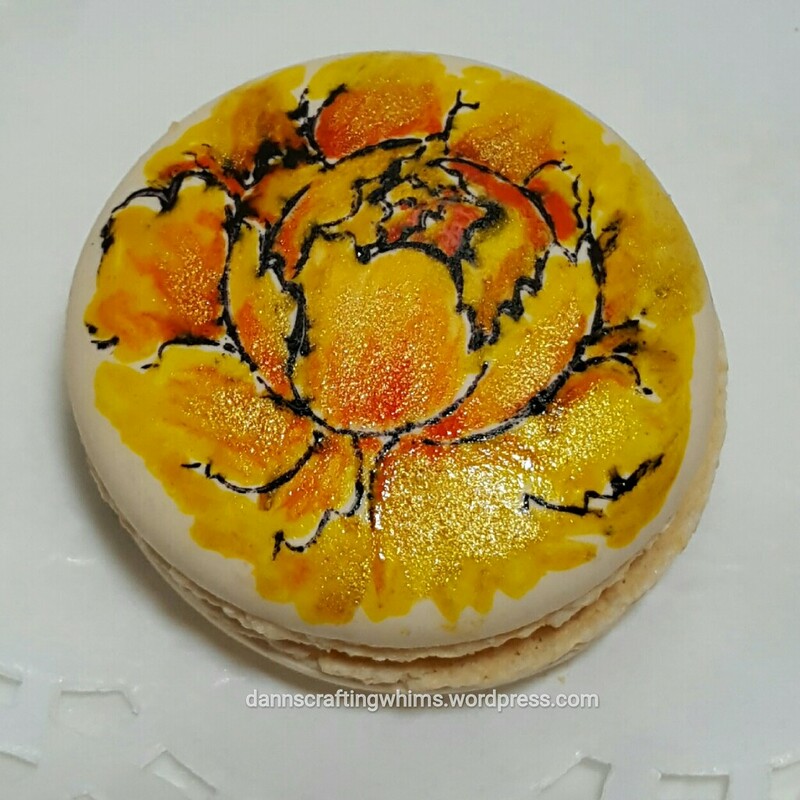 Edible stamping is something that I’ve never tried but yours turned out beautifully. 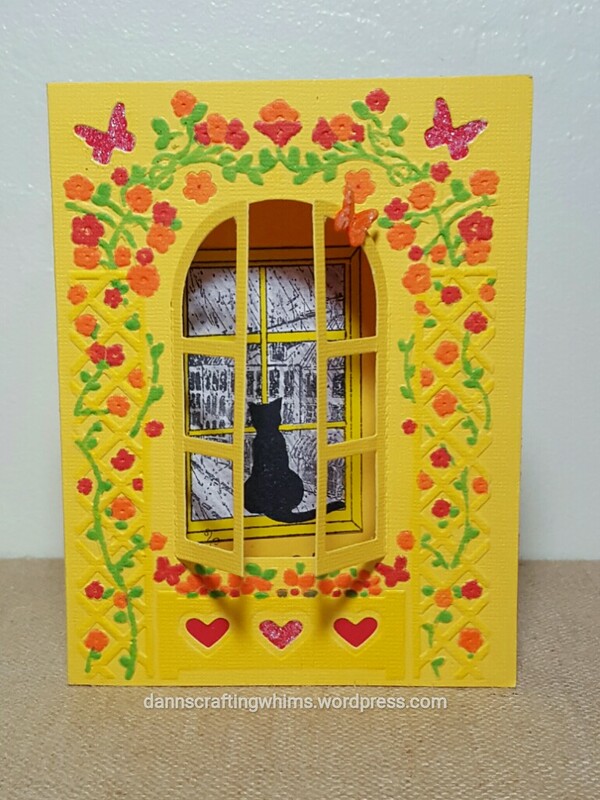 The window card is adorable and so pretty, with that clever Do Crafts die. Coffee and decorated macaroons…looks like a party to me. Love these. Wow, wow, TRIPLE wow! I have never seen such a fantastic post that combines art in the kitchen with art in the craft room! I am such a baking disaster, so I really admire anyone who can make something taste good AND look good! 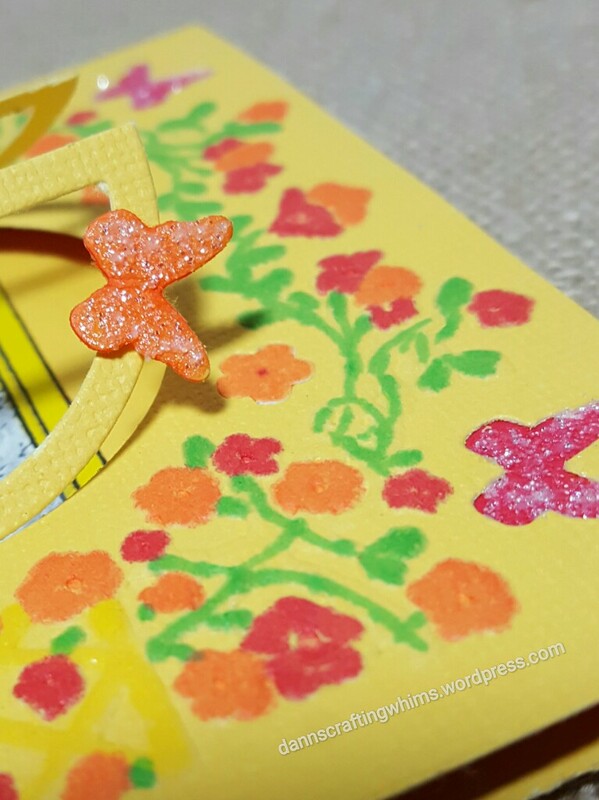 What a treat to see artistic cookies paired with a delightful card. 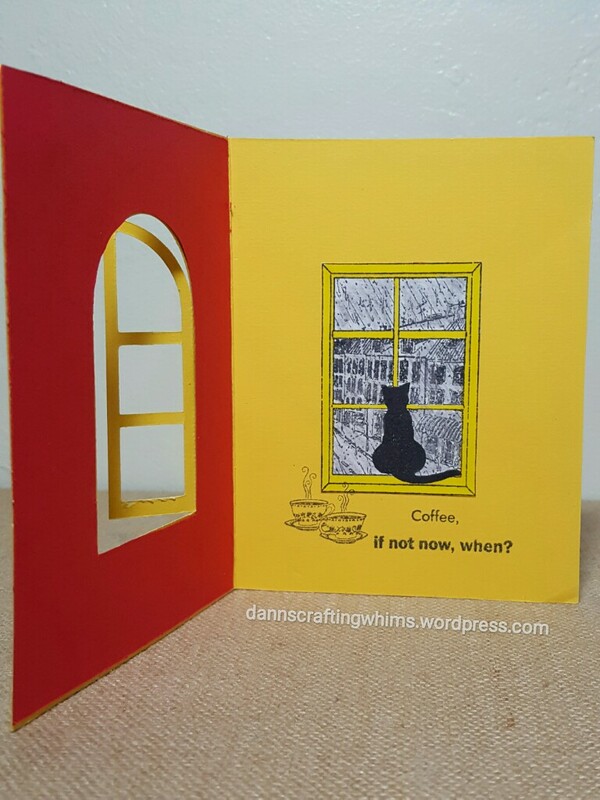 I especially love the way you made the card dimensional with the window! It is adorable inside and out! This was such an inspiring post and I’m so glad you shared your talents with us for this week’s Simon Says Stamp Monday Challenge! I can see a beautiful decorated tea table, with your sweet window card and delicious cookies. These are so beautiful and love that card… the windows… just beautiful! Oh my!!! I’m in love for your projects!!! Very cool!!! what a fun post! Love how you have used the cat in the window ‘in the window’ and those macaroons look amazing (way too pretty to eat)!! Love the macaroons and your beautiful window card!